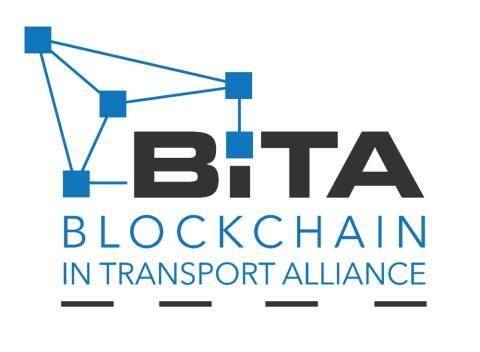 Panalpina has joined the Blockchain in Transport Alliance (BiTA), a forum of leading tech and transportation companies for the development and implementation of blockchain standards in the freight industry. The company sees many advantages of blockchain technology for freight forwarding and logistics operations in general, but also for specific areas such as perishables in particular. Panalpina has joined the Blockchain in Transport Alliance (BiTA), bringing over a century of experience in the freight forwarding business into the development of blockchain technology, which has the potential to disrupt the sector. BiTA is a forum of leading tech and transportation companies for the development and implementation of blockchain standards. Members aim to educate the market on blockchain applications and encourage their use through implementation. Blockchain creates a digital record of every transaction made in a decentralized and secure way using cryptography.BiTA standards will address how the technology will impact contracts, freight payments, asset maintenance and ownership history, chain of custody of freight, and other issues facing the industry. “Our goal is to bring together leading companies in the freight and technology industries that have a vested interest in the development of blockchain technology. As an asset-light company with a very long history in the freight forwarding and logistics industry, Panalpina’s contribution will be very valuable,” says BiTA president Chris Burruss. Blockchain use in freight forwarding and logistics is still in the early adoption phase, but Panalpina is already being approached by vendors, partners and customers inquiring about it. “It is likely that many blockchain clusters will emerge, for example centered around ports and customs authorities, carrier groupings, as well as third-party logistics providers and regional logistics networks. 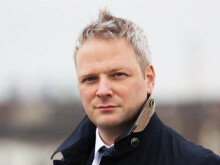 When it comes to using blockchain applications and managing and interacting with all these different clusters, we have chosen a twofold approach that will be coordinated by a new digital innovation unit,” says Ralf Morawietz, chief information officer at Panalpina. Panalpina sees many advantages of blockchain technology for freight forwarding and logistics operations. One advantage is the better tracking of orders and assets. Because of the decentralized nature of a blockchain, no single entity is in control of the tracking process, which will increase transparency in the supply chain and ultimately improve consumer trust. In the area of perishables, for example, blockchain technology can be used to reliably track products from farms to grocery stores, which allows for very precise and quick reports or recalls. Other benefits range from better scalability of operations to optimized capacity monitoring and pricing, fewer errors in payment processing and auditing, improved compliance, easier identification of attempted fraud, theft prevention, ease of building trust and gaining real-time feedback from customers. The Panalpina Group is one of the world's leading providers of supply chain solutions. The company combines its core products – Air Freight, Ocean Freight, and Logistics and Manufacturing – to deliver globally integrated, tailor-made end-to-end solutions for twelve core industries. Drawing on in-depth industry know-how and customized IT systems, Panalpina manages the needs of its customers' supply chains, no matter how demanding they might be. Energy and Project Solutions is a specialized service for the energy and capital projects sector. The Panalpina Group operates a global network with some 500 offices in around 70 countries, and it works with partner companies in another 100 countries. Panalpina employs approximately 14,000 people worldwide who deliver a comprehensive service to the highest quality standards – wherever and whenever. Panalpina has launched the Panalpina Digital Hub to embrace new technologies including the Internet of Things (IoT), artificial intelligence (AI) and blockchain that have the potential to disrupt the business in the coming years. The new business unit is to explore innovative technologies, develop new digital solutions for customers, and engage with digital start-up companies. Panalpina is proud to have participated in the Logistics & Supply Chain 4.0 hack challenges at Bosch Connected Experience (#BCX18), the annual Internet of Things (IoT) hackathon by Bosch. An international team of eight developers and two hack coaches coming from Basel, Lisbon and Luxembourg used machine learning to predict the future. Panalpina has joined the global innovation platform Plug and Play, the best known and most active accelerator program in the area of supply chain and logistics. The Digital Hub is tasked with exploring disruptive technologies and developing new digital solutions for customers as well as realizing business opportunities for Panalpina. In an interview with innoFRAtor, a platform by Fraport, Air Cargo News and German publication DVZ, Panalpina’s Luca Graf explains the reasons for setting up the new business unit and how it can add value for customers. Imagine a world in which products plan their own journeys around the globe. Panalpina and Bosch are working on the solution. In his keynote presentation during this year’s Bosch Connected World, Panalpina CEO Stefan Karlen, provided a public demonstration of how the latest IoT technologies in use and those being developed will shape tomorrow’s supply chains – IoT connected supply chains. This year’s top Internet of Things (IoT) event is around the corner. Bosch Connected World will take place February 21-22 at STATION-Berlin. The purpose of the conference is to provide the inspiration, education, and connections needed to thrive in IoT. In the spirit of interconnectedness, we are sharing five stories that look at the present and future of IoT so that you can warm up to the event . 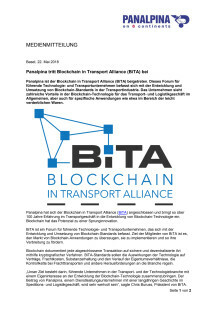 Panalpina ist der Blockchain in Transport Alliance (BiTA) beigetreten. 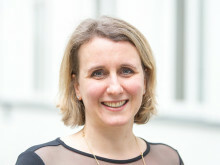 Das Forum für führende Technologie- und Transportunternehmen befasst sich mit der Entwicklung und Umsetzung von Blockchain-Standards in der Transportindustrie. Panalpina sieht zahlreiche Vorteile in der Blockchain-Technologie für die Industrie allgemein, aber auch für spezifische Anwendungen, z.B. im Bereich der Frischwaren.